It’s been a while since we’ve last seen a new workstation graphics card from AMD. With their Fiji GPU not being a good fit for the market, the company hasn’t had a significant update of the lineup since 2014, when Tonga was introduced into the mix. However as part of their SIGGRAPH 2016 professional graphics event, AMD is giving their professional card lineup a proper update and then some. 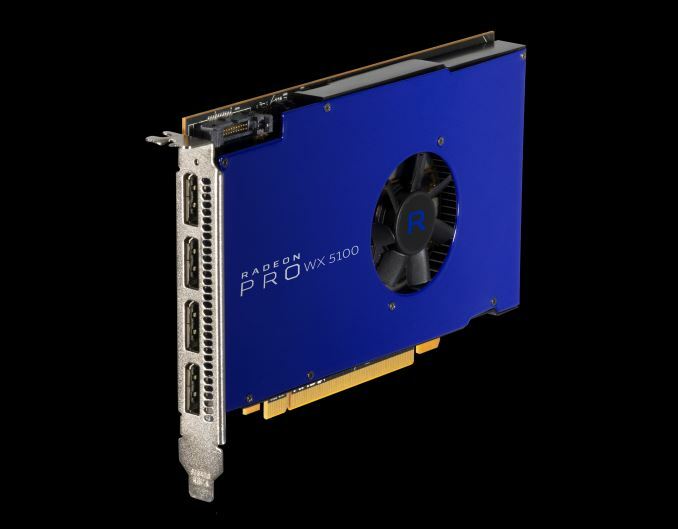 Announced Monday night, the company is introducing 3 new cards under their new Radeon Pro WX family, the WX 7100, WX 5100, and WX 4100. Powered by the AMD’s new Polaris family of GPUs, AMD is looking to bring the architecture’s power efficiency and display controller improvements to their workstation users. As this is based on the Polaris 10 and Polaris 11 GPUs, like their consumer desktop counterparts, AMD is targeting the bread-and-butter workstation market with their latest wares, in this case meaning the sub-$1000 market. Memory Clock 7Gbps GDDR5 5Gbps GDDR5 ? ? TDP 150W? 150W ? ? Branding aside (more on that later today), the Radeon Pro WX series is essentially a continuation of AMD’s existing FirePro W series lineup and the traditional workstation market it targets. To that end the new Radeon Pro WX cards are retaining the FirePro W series numbering system, indicating which card/tier they are a replacement of. 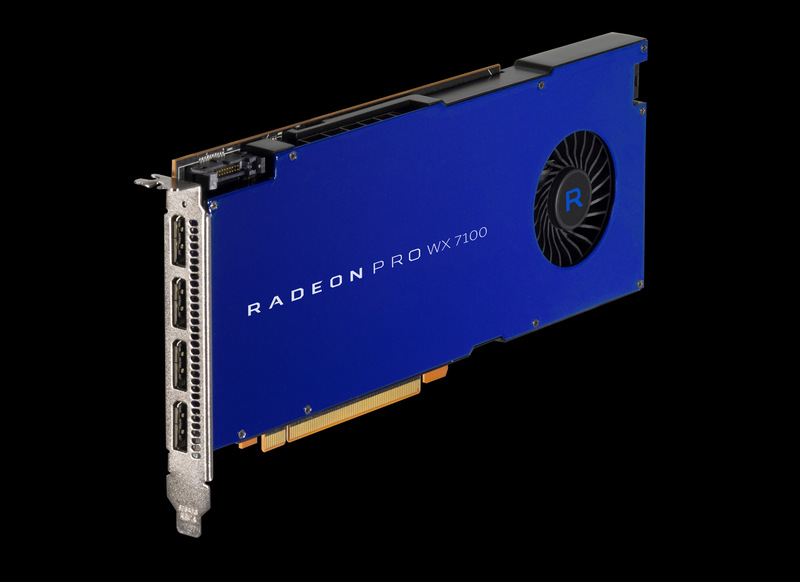 At the top of the new Radeon Pro WX stack is the WX 7100. The successor to the Tonga based W7100, this is based on AMD’s leading Polaris 10 GPU. Relative to its predecessor then, it should offer a decent performance boost, combining a slightly larger number of SPs with higher clockspeeds. AMD has disclosed that the card will ship with 2304 SPs (36 CUs), which is a fully enabled Polaris 10 GPU, making this very similar to the consumer RX 480. Meanwhile specific clockspeeds have not been revealed, but given AMD’s 5 TFLOPs minimum, this puts the boost clock at no lower than 1.08GHz. On the memory side the card will be shipping with 8GB of GDDR5 attached to a 256-bit bus. Clockspeeds have not been disclosed, but the consumer counterpart to this card, Radeon RX 480, used 8Gbps chips, so I’d expect at least 7 for the workstation card. I am a bit surprised that AMD opted to go with just 8GB of memory here – Polaris 10 should be able to support 16GB – but given the price goal and the target market, it makes sense. On the TDP front I’m still waiting for AMD to post the full specifications of the card. But it’s a very safe bet it’s a 150W card given the GPU configuration and the fact that its predecessor hit the same power target. Speaking of which, like W7100 before it, this is a single slot, full profile card. 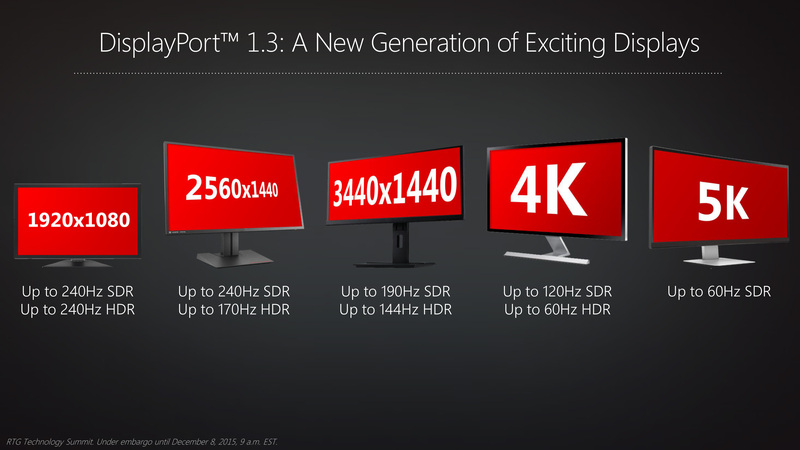 AMD has once again given the card 4 DisplayPort outputs, this time capable of the newest DisplayPort 1.4 standard. The second of the new WX trio is the WX 5100. Also based on the Polaris 10 GPU, this card opts for a lower balance of price, performance, and power consumption. This replaces the Bonaire based W5100, and comes with 1792 SPs (28 CUs) enabled, and a clockspeed that will be at least 1.2GHz. Compared to its predecessor it should be massively faster as AMD has more than doubled the number of SPs, not to mention the clockspeed boost. Attached to the GPU will be 8GB of GDDR5 memory over a 256-bit bus. Like the RX 7100 AMD has not disclosed memory frequencies here, though I’m going to be surprised if it’s as high as its bigger sibling since it needs to be a cheaper and lower power card. On that note TDPs are not available either; W5100 was a 75W card, but given the use of a mostly enabled Polaris 10, I’m not sure that’ll be the case here. RX 5100 is essentially a second-tier to 7100, which is something that did not exist in the previous FirePro generation. In terms of build we’re looking at a card that takes a cue from its predecessor, utilizing a single wide, full profile, but overall relatively short card design. AMD is aiming for continuity with the previous generation in their card designs, so WX 5100 should be a drop-in replacement in that respect. Last but not least we have the WX 4100. This replaces the W4300 as the low performance member of the workstation card family. As you might expect from such a description, this is based on AMD’s forthcoming Polaris 11 GPU, which so far we haven’t seen yet, but we’re told is aggressively power optimized. In terms of underlying hardware we’re looking at a fully enabled Polaris 11 GPU, with 1024 SPs (16 CUs), clocked at no less than 975MHz boost. Relative to its predecessor it should deliver a good performance boost, with 33% more SPs and a modest clockspeed bump. With regards to memory, we’re looking at 4GB of GDDR5 attached via a 128-bit bus. Memory clockspeeds have not been disclosed. For that matter neither has TDP, but given that this is a Polaris 11 card meant to replace the W4300, it’s a very safe bet that this is a sub-75W card. For design we’re looking at the only low profile member of the new WX family. The card utilizes a single wide cooler design and is outfit with mini-DisplayPorts in order to get 4 of them on a single low profile card. While the immediate performance and power efficiency gains afforded by AMD’s Polaris architecture are going to be the biggest piece of news here, Polaris brings other new functionality to the table as well. For the professional graphics market and FirePro/Radeon Pro users, these should be some very welcome changes. When it comes to the display controller, Polaris represents a big step up from AMD’s prior generation architectures. DisplayPort 1.4 is now supported, which means that these cards can be used to drive 5K monitors via a single port, allowing up to 4 of such monitors to be driven per card. Meanwhile this also brings full and formal support for HDR and its many requirements (e.g. HDR metadata), which should be a boon for media users, especially now that HDR monitors are hitting the market. And though it’s not directly exposed on the new WX cards since all of them use DisplayPort, HDMI 2.0b is also supported, which again for media users should be useful for when they need to work specifically with HDMI displays/TVs via an adapter. Along those lines, Polaris also introduces AMD’s new video encode and decode block. This marks the first time that HEVC decode and encode have been available on a FirePro workstation card, This once again is another media-centric feature in the pro graphics workspace, as it allows for much better (and faster) support for HEVC content, including of course HDR content. 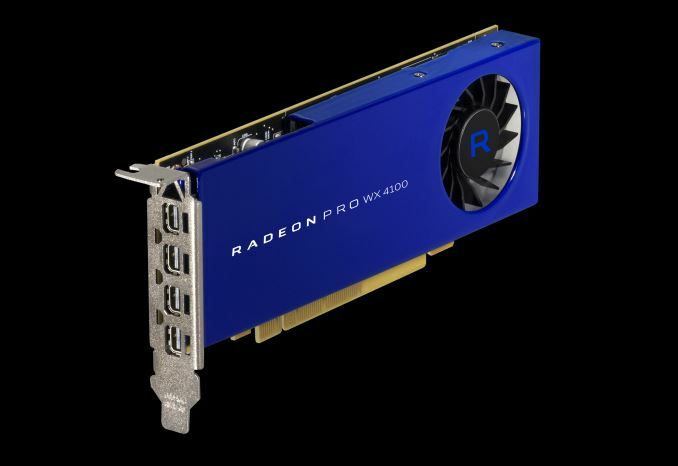 Finally, getting back to AMD’s Radeon Pro reformation, among the other changes AMD has announced is that they have significantly extended the warranty period for these new Radeon Pro WX cards. Whereas the older FirePro cards had a 3 year warranty, these new cards come with a 10 year warranty. Looking at the fine print in AMD’s announcement, this is compared of a 3 year warranty plus a 7 year extended warranty. I suspect this means that support after 3 years is more limited (e.g. possibly only hardware support and critical security fixes), but we’ll see what AMD has to say. But to put this in perspective, if you went back 10 years from now, this would mean AMD would still be supporting their ancient DX9-era R500-based FireGL 7300.Raja Koduri quipped that he’s never heard of anyone using a workstation card for 10 years, and I don’t doubt he’s right. Wrapping things up, the new Radeon Pro WX series cards will be released in Q4 of this year. AMD has not announced pricing at this time beyond the fact that the entire lineup will be under $1000. Pricing will be released closer to launch, though as AMD themselves have noted, most of their sales are via preconfigured OEM workstations, so the bulk of their customers will never buy a card directly to begin with. In any case, AMD’s regular OEM partners such as HP have already announced their support, so we should be seeing WX-equipped workstations show up in Q4 as well. Did anyone else notice that the WX 4100 is a PCIe 8x card? I highly doubt there will be a performance impact due to this decision, but I bet there will be a BOM impact. It might be for those quadro's nvidia released recently, but if you look at their entire portfolio, they actually have products which are different silicon, that is NOT crippled in terms of FP64 performance, uses ECC memory and MORE of it and all that good stuff. And hey, if I wanted to say "nvidia is better" that's what I would have said straight away. Have people become so dim that any criticism for AMD is automatically interpreted as nvidia promotion? It may not be "fused off" in a Quadro, but it's severely limited. P5000 and P6000 FP64 are reported to be a meager 1/32 of FP32. If the PRO cards aren't getting decent double precision, is there anything that does? Erm, this is how all Pro cards are; red or green. Lower clock speeds for stability, higher price to offset extra software optimizations and lower volume.